To evaluate the efficacy of ivermectin and combined ivermectin–metronidazole therapy in the treatment of ocular and skin lesions of Demodex folliculorum. One hundred twenty patients with skin lesions and anterior blepharitis, whose infestation was treatment-resistant and who had a Demodex count >5 mites/cm2 for skin lesions or ?3 mites at the root of each eyelash, were recruited. The treatment regimens were ivermectin and ivermectin–metronidazole combined therapy. We enrolled 15 patients from each of four groups for each treatment regimen. Demodex was detected by standardized skin surface biopsy for skin lesions. Three eyelashes from each affected lower eyelid were epilated and examined. The study subjects were followed-up once a week for four visits. There was a difference in the mite count between the subgroups taking ivermectin and combined therapy during all follow-up visits. At the last visit, in the combined therapy subgroup, 1.7% of patients showed no clinical improvement, 26.7% showed a marked clinical improvement, and 71.6% showed complete remission. In those on the ivermectin regimen, 27 patients had a mite count >5 mites/cm2, 21.7% showed no clinical improvement, 33.3% showed a marked improvement, and 45% showed complete remission. 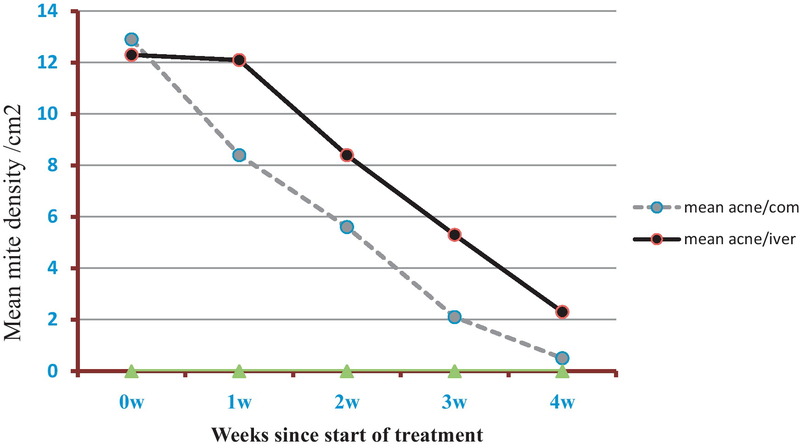 Combined therapy was superior in decreasing the D. folliculorum count in all groups and in reducing the mite count to the normal level in rosacea and in anterior blepharitis. On the other hand, the two regimens were comparable in reducing the mite count to the normal level in acne and peri-oral dermatitis lesions. 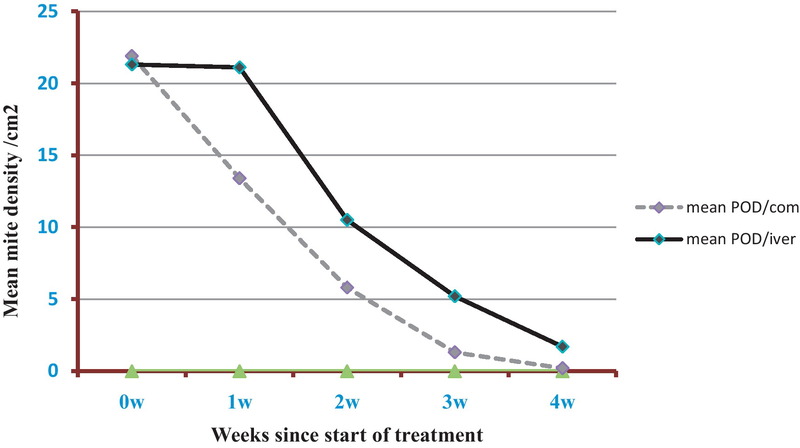 The aim of this study was to evaluate the efficacy of ivermectin and combined ivermectin–metronidazole therapy in the treatment of refractory anterior blepharitis and skin lesions of D. folliculorum. This was a randomized, single-blind, controlled clinical trial, comparing the efficacy of ivermectin and combined therapy with ivermectin–metronidazole in the treatment of anterior blepharitis and skin lesions of D. folliculorum. This study took place in the Dermatology and Ophthalmology Clinic of the Mansoura University Hospitals between June 2011 and February 2012. One hundred twenty patients were enrolled (mean age 36.71?±?12.4 years) and categorized into four groups of 30 patients each (patients with acne vulgaris, rosacea, peri-oral dermatitis, and anterior blepharitis). The selection criteria for patients with skin lesions were: a treatment-resistant infestation, with D. folliculorum mite density >5 mites/cm2. The potential criteria for the diagnosis of Demodex blepharitis are summarized as follows:16 (1) clinical history: high index of suspicion when blepharitis is refractory to conventional treatments, or when there is madarosis or recurrent trichiasis; (2) slit-lamp examination: typical cylindrical dandruff at the root of eyelashes; (3) microscopic confirmation: detection and counting of Demodex mites in epilated lashes. Patients with a mite density ?5 mites/cm2 for skin lesions or with <3 living mites/eyelash, a history of systemic or topical antibacterial or anti-inflammatory drugs in the 60 days before study entry, those with a known hypersensitivity to ivermectin or metronidazole, and pregnant women were excluded. In patients with anterior blepharitis, we also excluded those with posterior or mixed blepharitis, contact lenses, meibomian gland dysfunction, and any previous eye surgery. Informed consent was obtained from each of the participants, and the study was performed in accordance with the principles of our institutional ethics committee. At the time this study was designed there were insufficient data to perform a reliable sample size calculation. So we anticipated that two groups of 60 patients each would be sufficient to indicate efficacy of the two regimens at 4 weeks. Based on the outcome of this pilot study, we will design a larger randomized controlled trial, including a large number of patients, based on a power calculation. The 120 participants were randomly assigned to either combined therapy or ivermectin treatment at a ratio of 1:1 (15 patients for each treatment regimen from each group) using a computer-generated randomization schedule. The assignment was done in a single-blinded manner, in which the subjects were blinded to the treatment assignment. Since metronidazole has an anti-inflammatory and acaricidal action, it is expected to have a better effect in combination with ivermectin and improve the outcome of treated patients. In each group 15 patients received combined therapy with metronidazole (does 250?mg three times per day for 2 weeks) and ivermectin (two doses of 200? ?g/kg, 1 week apart), and 15 patients received ivermectin alone (two doses of 200? ?g/kg, 1 week apart). All patients were then followed-up weekly for four visits. For the detection of Demodex in anterior blepharitis, under a slit-lamp biomicroscope three eyelashes from each lower eyelid were epilated with fine forceps. Eyelashes were placed on a glass slide and mounted with a cover slip. Epilated eyelashes and skin samples were clarified with two to three drops of immersion oil and examined microscopically at standard magnifications (×40 to?×?100) as soon as possible (within 2–4?h), as the movement of mites decreases with time and they may even disintegrate.18 For eyelashes, determination of ?3 living parasites at the root of each eyelash was diagnosed as infestation. The Demodex count was recorded as the total number of mites found in a total of three lashes per eye. For the diagnosis of a skin sample infestation, >5 living parasites in an area 1?cm2 was required.19 Patients were assessed prior to randomization and weekly for 1 month throughout the study. The outcome measurements were done at the last visit. The primary outcome was a decrease in mite density for each treatment (?5 mites/cm2 for skin lesions and <3 living mites/eyelash). Secondary outcomes were clinical improvements in itching, burning, redness, and scaling at the root of the lashes in anterior blepharitis patients, and improvements in erythema, dryness, scaling, roughness, and/or papules/pustules in skin lesions. Assessment of the outcome samples was done by two unblinded parasitologists and then reviewed by another independent blinded professor of parasitology to avoid bias. Data entry and analysis were all done using SPSS software version 17 (Chicago, IL, USA). Results were expressed as mean ± standard deviation (SD), or number (%). Comparisons between the mean values were done using the independent sample t-test and Mann–Whitney test. The Chi-square test was used to compare the primary outcome in ivermectin and combined regimens and for comparison between categorical data (number (%)). The 95% confidence interval (95% CI) for the difference between independent proportions was calculated by the Wilson with continuity correction method. A p-value of <0.05 was considered statistically significant. One hundred twenty eligible patients were enrolled in this study; no patient missed any follow-up visit or discontinued treatment. Sixty patients were allocated to receive ivermectin and 60 to receive the combined therapy. Baseline characteristics of the patients in each group are summarized in Table 1. In the cases who received ivermectin alone, there was a gradual reduction in the mean follicle mite count at the first week visit (Table 2). However, rebound elevation in the mite count was evident in the third week in some patients with rosacea and those with anterior blepharitis lesions (Table 2). SD, standard deviation; CI, confidence interval; p-value, probability of error. 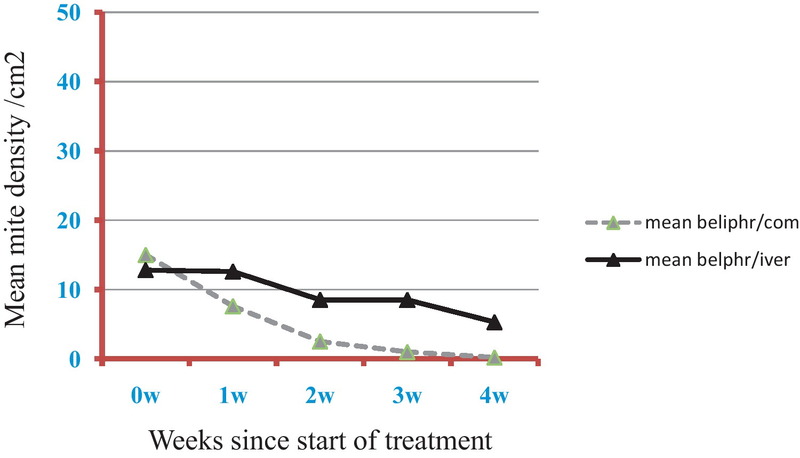 In the combined therapy subgroup, the mean counts of Demodex were dramatically reduced in all patients within 1 week (Table 2). 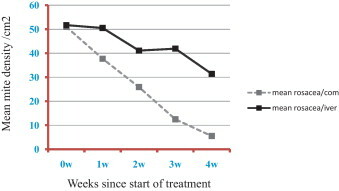 In comparing the efficacy of the two regimens, we demonstrated that the combined therapy was superior in decreasing the mean count of D. folliculorum in all groups (p < 0.05) (Table 2) and in reducing the mite count to a normal level in rosacea (mite density ?5 mites/cm2) (p?<?0.001; 95% CI 0.4–0.9) (Figure 1; Table 3) and in blepharitis (<3 mites/eyelash) (p?=?0.002; 95% CI 0.2–0.8) (Figure 2; Table 3). The two regimens were comparable in terms of the reduction in mite count to a normal level in the acne group (p?=?0.1; 95% CI ?0.04–0.6) (Figure 3; Table 3) and peri-oral dermatitis group (p?=?0.5; 95% CI ?0.1–0.4) (Figure 4; Table 3) (mite density ?5 mites/cm2). Mite density of rosacea group before treatment and through follow up visits using different regimen therapy. CI, confidence interval (by Wilson with continuity correction). Mite density of blepharitis group before treatment and through follow up visits using different regimen therapy. Mite density of acne group before treatment and through follow up visits using different regimen therapy. Mite density of peri-oral dermatitis group before treatment and through follow up visits using different regimen therapy. 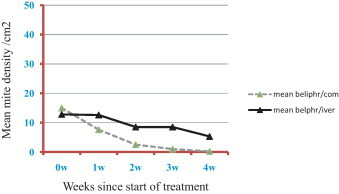 With regard to clinical improvement, at the last visit for those on the combined therapy regimen, 1.7% of patients showed no clinical improvement, 26.7% showed a marked clinical improvement, and 71.6% showed complete remission, while in those on the ivermectin regimen, 27 patients had a mite count >5 mites/cm2, 21.7% of them showed no clinical improvement, 33.3% showed a marked improvement, and 45% showed complete remission. At the end of the follow-up, one case on the combined therapy regimen had an infestation that continued to be treatment-resistant (the mites were persistent in their lesions) and after histopathological examination of the lesion, the case was diagnosed as lupus miliaris disseminatus faciei (LMDF). There are no standardized therapeutic recommendations for the treatment of demodicidosis. Although topical therapy alone is often not sufficiently effective, many reports have been written on the use of topical medications like lindane,20metronidazole,21 benzyl benzoate,19 permethrin,22 hexachlorocyclohexane,23 and camphor oil.24 Few reports have been written on the systemic medications, e.g., oral ivermectin.22, 25 Hence the purpose of this study was to evaluate the therapeutic and clinical outcomes of the oral administration of an ivermectin regimen compared with combined ivermectin and metronidazole in the treatment of D. folliculorum-associated anterior blepharitis and skin lesions. In the present work, during the first week of follow-up, no obvious change in the mite count was observed in all the groups receiving ivermectin, while through the third week, a rebound elevation in the mite count was observed in some cases in the rosacea and anterior blepharitis groups. However, in the fourth week there was a decrease in mite counts in all the studied groups. These results agree with those of Holzchuh et al.,26 who observed a significant improvement in the absolute number of D. folliculorum in the eyelashes after treatment with oral ivermectin. Also, Baima and Sticherling27 used oral ivermectin for skin lesions caused by Demodex, in combination with 4% pilocarpine gel in blepharitis, and reported a statistically significant reduction in the number of mites after treatment. Neither study pointed to a reduction in the mite count to the normal level after the administration of oral ivermectin in any of the studied cases. These results, together with our results, strongly infer that an ivermectin regimen alone cannot eradicate a Demodex infection but only reduce the number of mites. There are few reports on systemic metronidazole therapy for D. folliculitis. Studies on oral metronidazole alone for the treatment of Demodex skin lesions have shown a marked reduction in the inflammatory picture, but not of the Demodex population.28, 29 However in the study of Schaller et al.,30 therapy with the oral administration of 250?mg metronidazole three times a day for 2 weeks resulted in a rapid and lasting recovery. Subsequent follow-up evaluation for the next 9 months showed excellent control of the disease. Repeated scrapings remained negative for D. folliculorum mites. Other studies have reported complete recovery, with the disappearance of facial mites in treatment with combinations of oral and topical metronidazole; in a case of fulminant rosacea-like eruption with multiple D. folliculorum mites,21Grossmann et al.31 used 750?mg/day metronidazole for 3 weeks in conjunction with 100?mg/day prednisolone, topical 2% metronidazole, and 0.15% lindane emulsion, and in a study by Anane et al.,32 the patient was put on topical and oral metronidazole for 2 months and on yellow mercury ointment for 15 days. The facial mites disappeared and there was complete remission without recurrence. 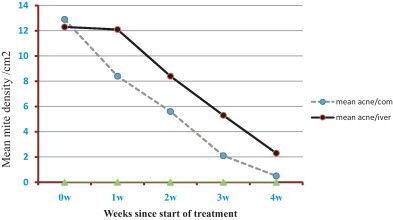 Although this combination regimen has not been studied before, we found that in the combined therapy regimen, there was a reduction in the mite count from the first week and through the follow-up visits. With regard to the reduction in the mite count to the normal level, only one case continued to resist treatment, and after a histopathological examination the case was diagnosed as LMDF. 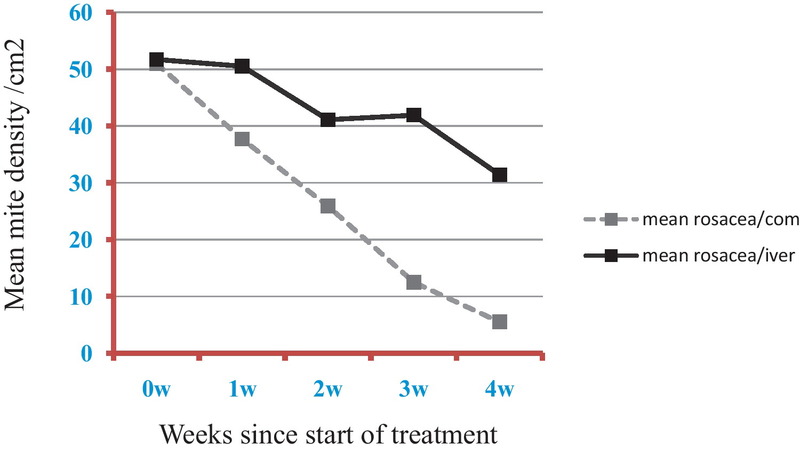 By comparing both regimens in terms of the decrease in mite count, we found that the reduction with combined therapy was statistically higher than that for ivermectin alone in all the studied groups. In addition, the combined regimen was significantly better at reducing the mite count to the normal level in the rosacea and anterior blepharitis groups. So, we suggest that the combined therapy works better than ivermectin alone on cases with different skin lesions and anterior blepharitis. In conclusion, the combined therapy was superior in decreasing the D. folliculorum count in all groups and in reducing the mite count to the normal level in rosacea and in blepharitis lesions, while the two regimens were comparable in reducing the mite count to the normal level in acne and peri-oral dermatitis lesions. The authors would like to thank all of the patients who participated in this study. © 2012 International Society for Infectious Diseases. Published by Elsevier Inc.